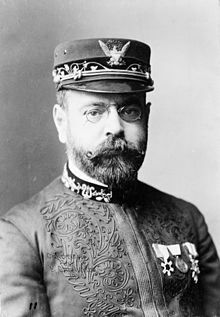 John Philip Sousa (/ˈsuːsə/;[a] November 6, 1854 – March 6, 1932) was an American composer and conductor of the late Romantic era, known primarily for American military marches. Because of his mastery of march composition, he is known as "The March King", or the "American March King" due to his British counterpart, Kenneth J. Alford also being known by the former nickname. Among his best-known marches are "The Stars and Stripes Forever" (National March of the United States of America), "Semper Fidelis" (Official March of the United States Marine Corps), "The Liberty Bell" (used as the theme for Monty Python's Flying Circus), "The Thunderer" and "The Washington Post". Sousa began his career playing violin and studying music theory and composition under John Esputa and George Felix Benkert. His father enlisted him in the United States Marine Band as an apprentice in 1868. After departing the band in 1875, Sousa learned to conduct. From 1880 until his death, he focused exclusively on conducting and the writing of music. He eventually rejoined the Marine Band and served there for 12 years as director. On leaving the Marine Band, Sousa organized his own band. Sousa aided in the development of the sousaphone, a large brass instrument similar to the helicon and tuba. John Philip Sousa was born in Washington, D.C., the third of ten children of João António de Sousa (John Anthony Sousa) (Seville, 22 September 1824 – 27 April 1892), who was of Portuguese and Spanish ancestry (son of João António de Sousa and wife Josefina Blanco, from Seville), and his wife Maria Elisabeth Trinkaus (Darmstadt, 20 May 1826 – 25 August 1908), who was of Hessian ancestry (daughter of Peter Trinkaus and wife Catherine Schafer). Sousa began his music education under the tuition of John Esputa Sr., who taught him solfeggio. This was short-lived, however, due to the teacher's frequent bad temper. His real music education began in 1861 or 1862 as a pupil of John Esputa Jr., the son of his previous teacher, under whom Sousa studied violin, piano, flute, several brass instruments, and singing. Esputa shared his father's bad temper, and the relationship between teacher and pupil was often strained, but Sousa nonetheless progressed very rapidly under Esputa, and was also found to have perfect pitch. He wrote his first composition, "An Album Leaf", during this period but Esputa dismissed it as "bread and cheese" and the composition was subsequently lost. When Sousa was 13, his father, a trombonist in the Marine Band, enlisted him in the United States Marine Corps as an apprentice to keep him from joining a circus band. In the same year, he began studying music under George Felix Benkert. Sousa completed his apprenticeship in 1875, and began performing on the violin. Sousa then joined a theatrical (pit) orchestra where he learned to conduct. He returned to the U.S. Marine Band as its head in 1880 and remained as its conductor until 1892. Sousa led "The President's Own" band under five presidents from Rutherford B. Hayes to Benjamin Harrison. Sousa's band played at two Inaugural Balls, those of James A. Garfield in 1881, and Benjamin Harrison in 1889. The marching brass bass, or sousaphone, a modified helicon, was created by J. W. Pepper – a Philadelphia instrument maker who created the instrument in 1893 at Sousa's request using several of his suggestions in its design. He wanted a tuba that could sound upward and over the band whether its player was seated or marching. The sousaphone was re-created in 1898 by C.G. Conn and this was the model that Sousa preferred to use. The United States Marine Band performs "The Washington Post"
On December 30, 1879, Sousa married Jane van Middlesworth Bellis (1862–1944). They had three children: John Philip, Jr. (April 1, 1881 – May 18, 1937), Jane Priscilla (August 7, 1882 – October 28, 1958), and Helen (January 21, 1887 – October 14, 1975). All were buried in the John Philip Sousa plot in the Congressional Cemetery. Wife Jane, daughters Jane Priscilla and Helen Abert joined the Daughters of the American Revolution (DAR) in 1907. Their patriot ancestor was Adam Bellis, who served under several different commands for the New Jersey troops in the American Revolutionary War. His musical education began at seven years, while his father was a member of the Marine Band. On 15 March (1881) the "March King" was initiated to the Scottish Rite Freemasonry in the Hiram Lodge No. 10, Washington, DC and later become Master Mason for 51 years. Late in his life, Sousa lived in Sands Point, New York. Sousa died of heart failure at the age of 77 on March 6, 1932, in his room at the Abraham Lincoln Hotel in Reading, Pennsylvania. He had conducted a rehearsal of "The Stars and Stripes Forever" the previous day with the Ringgold Band in its 80th Anniversary as its guest conductor, and attended a civic dinner at the hotel together with 100 leading citizens and all the members of the Lincoln Band. Sousa is buried in Washington, D.C.'s Congressional Cemetery. A school (John Philip Sousa Elementary) and a band shell were named after him and there was a memorial tree planted in nearby Port Washington, New York. 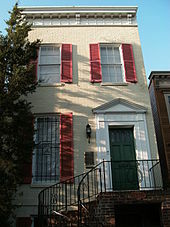 Wild Bank, his seaside house on Hicks Lane, has been designated a National Historic Landmark, although it remains a private home and is not open to the public. He was posthumously enshrined in the Hall of Fame for Great Americans in 1976, one of just 102 Americans ever to be honored in such a manner. In 1922, he accepted the invitation of the national chapter to become an honorary member of Kappa Kappa Psi, the national honorary band fraternity. On September 27, 1929, Sousa was made a Commander of the Order of the Phoenix at the Manlius Military Academy, Manlius, NY. This was a tribute to his service to music and in recognition of his friendship for the Manlius Cadet Band. In 1952, 20th Century Fox honored Sousa in their Technicolor feature film Stars and Stripes Forever with Clifton Webb portraying the composer. Fox music director Alfred Newman arranged the music and conducted the studio orchestra for the soundtrack. It was loosely based on Sousa's memoirs, Marching Along. There is a John Philip Sousa Bridge in Washington, DC. It carries Pennsylvania Avenue SE across the Anacostia River. "The Gladiator March", Sousa's first hit. 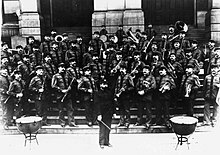 Sousa wrote marches for several American universities, including the University of Minnesota, University of Illinois, University of Nebraska, Kansas State University, Marquette University, and Pennsylvania Military College, now Widener University. As a trapshooter, he ranked as one of the all-time greats, and was enshrined in the Trapshooting Hall of Fame. He organized the first national trapshooting organization, a forerunner to today's Amateur Trapshooting Association (ATA). Sousa remained active in the fledgling ATA for some time after its formation. Some credit Sousa as the father of organized trapshooting in United States. He also wrote numerous articles about trapshooting. Sousa was a regular competitor representing the United States Navy in trapshooting competitions, particularly against the United States Army. Available records indicate that Sousa registered more than 35,000 targets during his shooting career. A quote from his Trapshooting Hall of Fame biography says it best: "Let me say that just about the sweetest music to me is when I call, 'pull,' the old gun barks, and the referee in perfect key announces, 'dead'." In his 1902 novel The Fifth String, a young violinist made a deal with the Devil for a magic violin with five strings. The first four strings of the violin excited the emotions of Pity, Hope, Love and Joy. The fifth string would cause the player's own death once played. When the violinist was unable to win the love of the woman he desired, he played upon the death string at what would be his final live concert. In 1905, Sousa published a book entitled Pipetown Sandy, which included a satirical poem titled "The Feast of the Monkeys". The poem described "a lavish party attended by variety of animals, however, overshadowed by the King of Beasts, the lion ... who allows the muttering guests the privilege of watching him eat the entire feast". At the end of his gluttony, the lion explained, "Come all rejoice, You've seen your monarch dine." In 1920, he wrote a 40,000-word story entitled "The Transit of Venus". The story recounts a group of misogynists called the Alimony Club who, as a way of temporarily escaping the society of women, embark on a sea voyage to observe the transit of Venus. The captain's niece, however, had stowed away on board and soon won over the men. Sousa also wrote a booklet entitled "A manual for trumpet and drum", published by the Ludwig drum company, with advice for playing drums and trumpet. An early version of the trumpet solo to "Semper Fidelis" was included in this volume. Sousa also appeared with his band in newsreels and on radio broadcasts (beginning with a 1929 nationwide broadcast on NBC). In 1999, "Legacy" Records (not the Sony label) released some of Sousa's historic recordings on CD. Even after death, Sousa continues to be remembered as "The March King" through the John Philip Sousa Foundation. The non-profit organization founded in 1981, recognizes one superior student in marching band for "musicianship, dependability, loyalty, and cooperation." The John Philip Sousa Foundation provides awards, scholarships, and projects such as The Sudler Trophy, The Sudler Shield, The Sudler Silver Scroll, The Sudler Flag of Honor, The Historic Roll of Honor, The Sudler Cup, The Hawkins Scholarship, National Young Artists, The National Community Band, and The Junior Honor Band Project. ^ "John Philip Sousa". Encyclopaedia Britannica. Retrieved September 15, 2018. ^ Bierley 2001, p. 23, 241. ^ a b c d e f g "The Library of Congress Biography: John Philip Sousa". Archived from the original on December 9, 2010. Retrieved January 10, 2008. ^ Warfield, Patrick. "John Philip Sousa." In Immigrant Entrepreneurship: German-American Business Biographies, 1720 to the Present, vol. 4, edited by Jeffrey Fear. German Historical Institute. Last modified May 27, 2014. ^ a b c d e Bierley 1973, pp. 28–29. ^ "Biography of John Philip Sousa". A Capitol Fourth – PBS. Capital Concerts. Retrieved January 1, 2013. ^ Bierley 1973, p. 32. ^ a b "A Brief Timeline of Sousa's Life". Dallas Wind Symphony. Archived from the original on October 7, 2011. Retrieved September 16, 2018. ^ James A. Garfield (1989). "Inaugural Addresses of the Presidents of the United States". Archived from the original on December 9, 2010. ^ Benjamin Harrison (1989). "Inaugural Addresses of the Presidents of the United States". Archived from the original on December 9, 2010. ^ "Sousaphone". Virginia Tech Music Dictionary. Virginia Tech University. Retrieved January 1, 2013. ^ a b Bierley, Paul Edmund, "The Incredible Band of John Philip Sousa". University of Illinois Press, 2006. ^ "The Sousa Band". America's Story. Library of Congress. Retrieved January 1, 2013. ^ "The Incredible Band of John Philip Sousa". Amazon.com. p. 46. Retrieved December 6, 2012. ^ Register of the Commissioned and Warrant Officers of the Navy of the United States and of the Marine Corps to January 1, 1890. Government Printing Officer. Washington, D.C. 1890. pg. 171. ^ Bierley 2001, p. 250. ^ Bierley 2001, p. 78. ^ McSherry Jr., Jack L. "John Philip Sousa". The Spanish–American War Centennial Website. Retrieved January 1, 2013. ^ "Lineage Book". Daughters of the American Revolution, 1922. p. 165. Retrieved August 13, 2015. ^ a b c "John Philip Sousa, Band Leader, Dies in Hotel at Reading". (special edition). The New York Times. March 6, 1932. Archived from the original on August 25, 2018. His musical education began at 7. He had already made up his mind that he wanted to be a musician, and four years later he won all the medals at the conservatory, the beginning of his collection of decorations, which is said to be the largest in his field in the world. That same year he became a violin soloist. ^ Paul E. Bierley (October 28, 1997). "Biography of John Philip Sousa". Scottish Rite Journal. Archived from the original on November 6, 2005. Paul E. Bierley is a member of Whitehall No. 761, Whitehall, Ohio. ^ "Congressionalcemetery.org". Congressionalcemetery.org. Retrieved December 6, 2012. ^ "The John Philip Sousa Bandshell". Port Washington, NY Patch. Patch. Archived from the original on June 2, 2012. Retrieved January 1, 2013. ^ "Sousa, John Phillip – Inductees". traphof.org. ^ "John Philip Sousa". psu.edu. Archived from the original on April 26, 2015. ^ "Prominent Members – Kappa Kappa Psi". Kappa Kappa Psi. Archived from the original on July 16, 2011. Retrieved January 1, 2013. ^ Brian, Greg. "Phi Mu Alpha Sinfonia Fraternity: A History of this Secret Society for Musicians". Yahoo! Voices. Yahoo! Inc. Archived from the original on February 15, 2013. Retrieved January 1, 2013. ^ Crowther, Bosley. "Stars-and-Stripes-Forever – Trailer – Cast – Showtimes". The New York Times. Retrieved January 13, 2013. ^ Bennett, William J.; Cribb, John T.E. (2013). The American Patriot's Almanac: Daily Readings on America. Thomas Nelson. p. 495. ISBN 9781595553751. ^ "John Philip Sousa Music and Personal Papers, circa 1880–1932". The Sousa Archives and Center for American Music. Retrieved November 12, 2015. ^ "US Code: Title 36, 304". Cornell Law School. October 30, 2006. Archived from the original on December 9, 2010. Retrieved November 2, 2006. ^ "Who's Who in Navy Blue". Wingert-Jones Music Inc. Retrieved December 6, 2012. ^ "Troop A – The Encyclopedia of Cleveland History". Ech.case.edu. Retrieved December 6, 2012. ^ "Minnesota March". University of Minnesota Marching Band. University of Minnesota School of Music. Retrieved January 11, 2016. ^ Frank, Brendan. "The Legacy of Illinois Bands". Illinois Bands. College of Fine and Applied Arts – University of Illinois. Archived from the original on May 12, 2011. Retrieved November 30, 2012. ^ "Sousa writes special march for Nebraska". The Daily Nebraskan. Lincoln, Nebraska. February 22, 1928. Retrieved November 30, 2012. ^ "History – Kansas State Bands". Kansas State Bands. Kansas State University Bands. Archived from the original on October 2, 2012. Retrieved November 30, 2012. ^ "Student Organizations – Band". Marquette University. Retrieved November 30, 2012. ^ "Vocal score of The Charlatan". Archive.org. March 10, 2001. Retrieved April 7, 2012. ^ "John Philip Sousa". Guide to Musical Theatre – Operetta. The Guide to Musical Theatre. Retrieved January 1, 2013. ^ "My religion lies in my composition". Brainyquote.com. March 6, 1932. Retrieved April 7, 2012. ^ a b c "John Philip Sousa". National Trapshooting Hall of Fame. Archived from the original on May 5, 2008. Retrieved February 25, 2008. ^ "John Phillip Sousa". Trapshooting Hall of Fame. Retrieved July 29, 2012. ^ John Philip Sousa (1902). The fifth string. Bowen-Merrill. Retrieved January 9, 2013. ^ "Pipetown Sandy: Sousa, John Philip, 1854–1932". Free Download & Streaming: Internet Archive. California Digital Library. Retrieved January 1, 2013. ^ "Willow Grove Park". Wgpark.com. Archived from the original on October 21, 2004. Retrieved April 7, 2012. ^ John Philip Sousa (1985). A book of instruction for the field-trumpet and drum: together with the trumpet and drum signals now in use in the Army, Navy and Marine Corps of the United States. Ludwig Music Pub. Co. Retrieved January 9, 2013. ^ Lawrence Lessig, 2008, Remix: making art and commerce thrive in the hybrid economy, London: Bloomsbury Academic. Chapter 1. ^ "March King: John Philip Sousa Conducts His Own Marches". amazon.com. Archived from the original on December 9, 2010. Retrieved February 25, 2008. ^ Lovrien, David. "What is the John Philip Sousa Award for band students?". www.dws.org. Retrieved October 19, 2016. ^ "Sousa Foundation". www.sousafoundation.net. Retrieved October 19, 2016. Bierley, Paul E. (1973). John Philip Sousa: American Phenomenon (revised ed.). Alfred Music. ISBN 9781457449956. Bierley, Paul E. (2001). John Philip Sousa: American Phenomenon. Alfred Music. ISBN 9781457449956. Bennett, Jeb. "John Philip Sousa: 100th Anniversary." Marine Corps Gazette 64, no. 10 (1980): 31–34. Warfield, Patrick. ""Salesman of Americanism, Globetrotter and Musician" the Nineteenth-century John Philip Sousa; 1854–1893." Diss., Indiana University, 2003.